Over the years, Five Talents has been blessed with a wonderful family of friends and supporters. These faithful friends have helped us to grow Five Talents from a small charity with a big heart to a world class leader in Christian economic development. Recently, we recognized one of these key impact makers during a Twentieth Anniversary Celebration. Jim Oakes has been a champion of development among the vulnerable poor and and has been actively involved in ministry with Five Talents for over fifteen years. Jim has traveled numerous times for Five Talents around the world including 6 trips to South Sudan. As a long-time Board Member and Board Chairman, Jim has volunteered countless hours to build, support, and encourage the ministry of Five Talents, even dedicating an entire year to volunteer as Five Talents acting Executive Director. 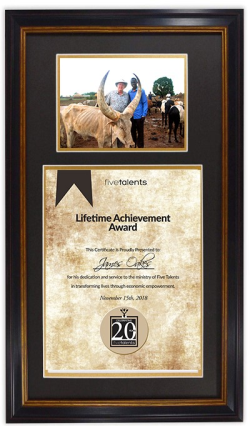 Because of Jim’s faithful service, Five Talents is pleased to award him with a Lifetime Achievement Award. Five Talents' accountant Aimee Davis writes about the time she spent with literacy trainer Euphemie Karerewa, who recently visited Washington, D.C. from Burundi, Africa. Diane Knippers was one of the most influential evangelicals in the United States and a founding board member of Five Talents.